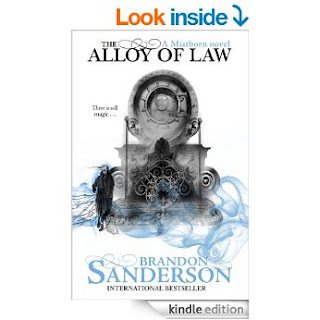 The Alloy of Law: A Mistborn Novel (Wax and Wayne series) by Brandon Sanderson. The three hundred years since the events of Mistborn have shaped Scadrial. Ever taller towers race for the clouds, railways as well as canals criss-cross the land. But this is still a land of magic. Kelsier, Vin, Elend, Sazed, Spook, and the rest may be part of history - or religion - but even as science reaches new heights, the old magics of Allomancy and Feruchemy still have a role in this reborn world. In the Roughs, the wilds beyond the cities, magic is a crucial tool for the brave men and women attempting to establish order and justice. One such is Waxillium Ladrian. After twenty years in the Roughs, Wax has been forced by family tragedy to return to the metropolis of Elendel. He must assume the duties and dignity incumbent upon the head of a noble house. Or so he thinks, until he learns the hard way that the mansions and elegant tree-lined streets of the city can be even more dangerous than the open plains of the Roughs. Before I begin, I must admit I haven't read the Mistborn Original Trilogy (the 3 books preceding this book), and the main reason for that is that they've never really appealed to me. But, I stumbled across The Alloy of Law, and I immediately became intrigued by the description and after reading several reviews reassuring me that I didn't need to read the original trilogy, I bought it. Brandon Sanderson is a well known author and is one of the A-list celebs when it comes to fantasy but apart from Elantris, I haven't really been wowed by his books - that's probably part of the reason why I avoided the original trilogy. Main character in The Alloy of Law is Waxillium Ladrian - What a name to give your main character - Anyway, Wax (for short), is a law-keeper, who had spent a good 20 years defending the Roughs, a place where criminals and other shady characters live, but after suffering a personal tragedy, he returns to the city, Elendel. But trouble seems to follow him wherever he goes, and he soon finds himself involved in the recent spate of kidnappings that have plagued the city. The book was short for a Sanderson novel, and it was interesting to learn that the author originally wrote the book as a creative writing exercise, not necessarily intended for publication, which may explain why the book was so succinct and the sentences to the point. The action scenes were well written and the dialogue flowed effortlessly. Sanderson infuses a heavy dose of humour into the book, and he pulls it off superbly. Throughout the book, the interaction between Wax and his sidekick Wayne, had me smiling at their antics. Wax is a fantastic character, who is instantly likeable and has real depth to him. In fact all the main characters are engaging, even the bad guys - I think it might the few times where I wanted to read more about the bad guy and learn about his past. The storyline wasn't unique, but it was far from boring, and the pace of the book was such that you never got stuck in a rut. I really enjoyed the book and for those, like me, who haven't read the original trilogy, it's perfectly fine to read as a stand-alone. If you're a fan of steampunk and fantasy then I highly recommended The Alloy of Law, and if you've read the original trilogy then you don't need me to tell you to read it.